A lot of stuff related mostly to translations also finished reports saving. FR translation ready. – [feature] Translation related code (finished some strings and redone reports code to support translations). – [feature] Reports are saved now (those were not saved in the previous version since those were unfinished and not compatible with translations). – [translation] FR translation done (note that translation might be not fully complete, especially when a new version is introduced there might be a few texts missing). Manual not translated yet. – [translation] RU manual translated. – [interface] Language selector on the main menu (flags on the left). – [interface] New end turn button (image instead of text). 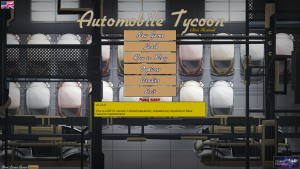 This entry was posted in Automobile Tycoon, New Version on January 29, 2018 by Chris.